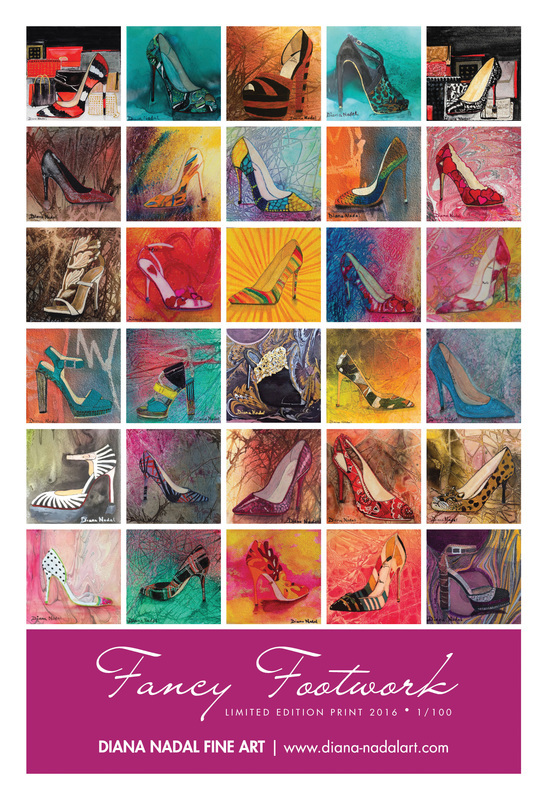 Features 12 Original Paintings from my "Fancy Footwork" series not featured previously with cover of selected shoes from the poster. Click on the "Add to Cart" button to purchase. Featuring 15 paintings completed this year. The palm trees, white sand and interesting plants along the shore in Tanzania are worth a visit. I can feel the breeze moving through the palm fronds. There is always something that takes our imagination away quickly to a nice, warm beach as soon as you see the palm trees. The palm trees in Tanzania with the white sand beaches were indeed one of those take me away places to visit. What a peaceful scene with the snow, the moonlight and the shadows across the snowy field. The warmth from the moon enhances the shapes of the trees. ​Painting a stand of trees in a field with the shadows and even some footprints made this painting more interesting. 5 1/2 x 7 1/2 Watercolor fit into 6 1/2 x 8 1/2 matted card w/envelope in plastic sleeve. When we visited Mallorca several years ago there was a stand of trees at the edge of resort for privacy but gave us enough view to see the Mediterranean just a few feet beyond. Using my technique with webbing and spraying concentrated watercolors formed this snowy forest scene. Using wider webbing creates the snow laden branches of the trees. ​This brings back memories from my childhood when we would go camping next to a lazy stream or inlet and be able to take the rowboat out for a ride. This was part of that backyard painting which had so many wonderful things to paint -- maybe too many. Until recently we have had a butterfly bush in our backyard and I have often stood close by to photograph the butterflies as they stop to get a little of the flower's nectar. This section of an original painting hung on my walls for years and I selected my favorite parts to make into an original card rather than paint over it. I love to paint items with color and this one certainly played that role in the original painting. This was a fun painting done years ago and I chose my favorite parts to make into original art cards. I feel like running out and buying a cantaloupe right now -- these look declicious. A recent workshop at our Fall Convention was a creative fun painting using torn coffee filters placed on wet paper and then applying watercolors of your choice. I decided to crop the painting which was just a "start" to focus on the abstract flowers which were formed by this process. When I decided to crop an original painting rather than paint over it, these two sections were especially fun for a card. Hope you think so too. Original art cropped to fit in matted card w/envelopes in plastic sleeve 6 1/2 x 8 1/2 The effort in creating the scribbling was well worth an original card when I cropped my 2nd unsuccessful nectarines in basket painting. Original art cropped to fit in matted card w/envelopes in plastic sleeve 6 1/2 x 8 1/2 Through the years it has been fascinating to see the squirrels getting into the bird's food -- not sure what this squirrel was planning as he approached the birdhouses. For The the "Lady" who loves her shoes-- this might be the perfect Christmas gift. 5 5x7 Fine Art Cards with envelopes in a clear plastic box. I truly can't get enough of wine caves as well as the joy when friends come together to toast to their friendship. 6 4 1/4 x 5 1/2 fine art cardsI had this background painting printed as a card. We never have enough "Thank you cards on hand when we need to send one. This pack contains . 5 of my favorite wine glass and bottle paintings which have been printed as 5x7 fine art cards with envelopes in a clear plastic box. 5 4 1/4 x 5 1/2 fine art cards of Fall foliage, Heron, butterfly and a place we visited in France in the Fall. 5 5x7 Fine Art Cards with envelopes in a clear plastic box. St. Emilion and St. Jean du Luz and the Dordogne River are some of our favorite places and ones you should visit when you travel to France. A savings of $5.00 when buying this pack and free shipping in United States. This set is from my cycling series of paintings of the Yellow Jersey Winners over the past several years at the Tour de France and Amgen . 1 5x7 fine art card each of Thomas Voeckler (he retires 2017), Fabian Cancellara (retired 2016 after Olympics), Chris Horner (from Oregon), Bradley Wiggins, Vincenzo Nibali, and Chris Froome (4 time winner of the yellow jersey). 8 of my favorite African paintings which I had cards made up from. These cards come in a box with card 4 3/8 x 6 with envelopes. 6 4 3/4 x 4 3/4 fine art cards with envelopes which includes fall colors and insects. 6 5x7 fine art cards with envelopes boxed. Favorite of mine is painting the doors of France and elsewhere on our trips. But is was also impressed by the caves and traveling to this special place. 6 4 1/4 x 5 1/2 fine art cards with envelopes in a box.The original painting was sold to the owner of these boots and she can hammer! This was one of the first "shoe" series paintings I did in my series and I am grateful to our dear friend to use this image. 6 4 1/4 x5 1/2 cards w/envelopes packaged in a card box with clear top.